Smoking is strictly prohibited in the condo or on the condo lanai and doing so will result in full loss of full security deposit. No clothing, towels or laundry shall be hung from lanai railing. No shoes, sandals, laundry, toys, trash or other personal belongings shall be left in the corridors. Apartment entry doors are to be kept closed at all times except during ingress or egress. If for emergency reasons, this unit cannot be available to the guest, the guest is entitled to full refund of all monies paid toward the booking of the unit for those nights that the unit is unavailable. No other arrangement or payment will be made to the guest. This condo is prettier than the pictures, and very well equipped.It's at the end of the Waikiki area, but still convenient to shops, restaurants, the beach, &amp; the bus line. (About a 10 minute walk to ala Moana shopping center- buy your groceries there, as well as anything else you can possibly imagine). The bed was very comfortable, and when we had trouble getting the t.v. working,the local contact for the condo responded immediately &amp; helped out. A great value for the money, although the cleaning fee (for a 3 day stay) seemed a bit high - but it is Hawaii, where nothing is cheap, and the daily condo rental itself was very reasonable. One of the best values for an oceanfront condo in Waikiki. Close to great Honolulu activities and a short walk across the Ala Wai Canal for quick access to Ala Moana Beach Park and Shopping Center. The expansive views overlook the Ala Wai Yacht Harbor. One can sip Pina Coladas from the outdoor lanai at sunset, watch the yachts go by and see the sun slowly drop below the horizon. The views and sunsets are spectacular and unparalleled. The Pacific Ocean views are unobstructed, something rare to find in Waikiki. There are also glittering city views at night. After a long day of swimming, surfing and playing, take a seat at the Lanai with your favorite drink and enjoy the smell of and the view of the Ocean. Watch the private boats that come back at the end of the day. On Friday nights, enjoy the fire works at Hawaii Hilton next door from the Lanai. The dining table is loacted close to the Lanai with unabstructed view of the Marina and the Ocean. Enjoy all comfortable living room with the Hawaiian decor. It is furnished for your outmost enjoyment with TV, cable, DVD & CD player. Enjoy the free wireless interent access. The sofabed turns into a comfortable bed for your enjoyment. Enjoy the fully-equiped kitchen with expansive views. There is a Subzero refrigerator, range, dish washer, microwave, blender, toaster and other kitchen accessories and enjoy dining at the best location in the area - oceanfront at your condo. The unit has one king size bed with a window to the marina and the unabstructed view of the Pacific Ocean. The Bedroom has direct access to the bathroom and the rest of the unit. The bedroom is fully furnished for your enjoyment with AC. Enjoy a relaxing shower at the newly remodeled bathroom. It is a short walking distance to world famous Waikiki Beach and Ala Moana beach. Simply walk down to street level and you have access to many well known restaurants. Walk to Ala Moana Shopping Center for all your necessities as well as some luxtury items. Don't forget Starbuck's coffee across the Street! We had good time here. The room is spacious and with good view. Alice, the contact we were given for any issue, was very responsive and pleasant.There are few things we would like to share to improve future guest's stay experience:- The oven's bake feature was not always working, it would turn off by itself before the set time and its baking coil was not on consistently. We ended up just using broil feature.- The fridge was cleaned but with very strong pinesol smell. Any food we left in fridge would absorb pinesol smell.- The main kitchen light switch was not consistently working. Sometimes it would turn on after few minutes delay after being switched on.Thank you! First time using Home Away. I was very nervous, but Shahin was great! Condo was spotless. When first opened the door it smelled like it was just cleaned. Kitchen has everything you need to make a meal. The mattress is on the harder side, but my husband and I found the bed comfortable. A/C works great, gets cold really fast. I didn’t have an issue with the balcony door, didn’t find it hard to open or close. And didn’t have trouble with street noise. The condo had extra things that came in handy like, coolers, stroller, beach toys, and a pack and play that we used as crib for our baby. Let’s talk about the view, the view, oh my the view! My family and I loved looking out and watching all the sail boats. I’d recommend it just for the view! But the condo really was great. The price and service was great! Would stay here again. 1. Total, 100% ocean view. Most Waikiki accommodations claim to have an ocean or beach view, but they are often obstructed by neighboring high rises or seen through a tunnel of concrete buildings. Here, you can enjoy your morning coffee watching rainbows, yachts, and fishing boats from the world's tiniest lanai. 2. Two televisions. When you tire of the ocean view you can choose between televisions in either the living room or the bedroom. More tech-savvy guests can take better advantage of that duplication than I. 3. Location. A short walk in the Diamond Head direction brings you into the heart of Waikiki; A short walk in the Ewa direction takes you to Ala Moana Park, Ala Moana Beach, and Ala Moana Center. .
4. A hot, high pressure walk-in shower. 5. Easy, affordable on site parking. Traveled with father, flew in from San Francisco, rental car, and spent most of the time outside of Waikiki for business. Location - At the west tip of Waikiki, barely at the edge. If you want to be in central Waikiki this isn't it. ABC Superette was across the street which made buying basics easy. Also a McDonalds if you need one. We wanted a place away from the noise, so naturally facing the Marina should shelter us from the tourist buses, garbage trucks etc. For the most part, we were right, except for two things - 1. There is a lot of gathering of people on the street, chatting, and also partying on docked boats Friday night. 2. It wouldn't be so much of a problem except the window and balcony doors don't seal well, or at all. Noise comes in as if the windows were open. That noise also includes garbage trucks at 4am, and the occasional tour bus taking a shortcut. The Duck boat tour also launches nearby where they have to use full throttle to get back onto land. Very loud. Parking - Parking is really easy, within the same building. Cost is $23 a day, and you can prepay the entire stay the first time you exit the parking garage. Note that there are steps going to the elevator, at least in our experience. We didn't see a 100% ADA access to the residence part of the building. Elevators are fast, so there isn't much waiting time. Amenities - This condo has almost everything you could ever need. In the kitchen, everything plus some basics like cooking oil, salt, pepper, sugar. In the closets, baby crib, stroller, sunblock, bug repellent spray, extra towels, iron/board, you name it. Kitchen feels completely new. WIFI gets about 6mbps down and 2mbps up, like DSL speeds. Quality - If you're reading down this far, you'll be interested to know that a lot of the floor tiles are loose in the unit. I think the owner must've been scammed with a bad tile contractor, or there is an issue with the subflooring of the building. The flooring in the bathroom is really bad, with all most all of the grout missing, and the tiles clicking as you walk over them. There is a downslope towards the shower which is either bc the tile contractor didn't level out the floor first, or something is still sinking in that corner. Didn't really affect the stay, but was unsettling at times. My dad complained everyday about it. Also again, the windows and balcony door does not seal completely. Shower pressure/flow was pretty low. Meanwhile the bathroom sink didn't have any water saver devices. Furnishings - lots of furniture, very useful and placed effectively. Bed was decently comfortable, but the head board is loose and not mounted securely to anything. Long chair in living room was comfortable and where I spend most of my time. There is one small chair for the tiny balcony, which in the end we didn't use much. Conclusion - Would we stay here again to resolve our noise sensitivity - No. Do we think its a good value - definitely. I'd definitely recommend this unit for a family of 4 with a tight budget. My husband and I stayed at the Ilikai Marina condo for 2 weeks and loved it. The location was perfect. We could walk to the Waikiki beach easily, as well as the Ala Moana Park and Beach. Our car was parked on the same level as the condo, making it convenient to load and unload the trunk. We were impressed with the congenial and helpful parking attendants.We thoroughly enjoyed the view of the marina, with the boats coming and going during the day. We sat on the balcony, with snacks and drinks, taking in the lovely sunsets many evenings. The laundry facilities were located one floor above the condo. All in all, we were very pleased with the condo, especially the location. We would happily return to this condo. Great view of marina, sunsets and fireworks.The condo was well equipped with everything needed for our stay. We enjoyed the use of beach towels, chairs, umbrellas and ice chest.Will definitely check this place for availability for our next trip! We loved the fantastic view of the marina! The condo was very nice and very clean. It is such a great location because you can easily walk along the beach or go for swim in 10 minutes. It is located very close to the ABC stores and a grocery store we found within a 10 minute walk that we could pick up some items like milk and bread. All the people that work at the condo were very kind and friendly. We enjoyed our trip very much! Mahalo! Thank you for taking the time to provide comments. We take your comments seriously and will do all we can to address them. To that end, we will re-examine our cleaning process and procedure. Fabulous location in Waikiki. The condo is clean, bright, and very comfortable for 2 people. Parking is a better price at this condo. Only issue was getting the key out of the combo lock. Other than that PERFECT stay!!! Good location close to buses. Unit was clean. $20 a day parking. Unit had beach items available for use. Unit a little worn, but had everything we needed at a good price. Plenty of restraunt options close by. Thanks for taking the time to provide feed back comments. I take my guests comments seriously. The unit bathroom and shower was remodeled in December 2016 and kitchen was remodeled in mid 2016. The bed mattress was replaced in early 2017. The living room and dinning room furniture were replaced in mid 2016. We regularly update and replace items in the unit as necessary. Hopefully, the guests will appreciate and enjoy the unit. Regarding parking, the building does not have free parking. The garage next door is very convenient. Unfortunately, the garage is not part of the building and as such I have no say about the daily rate. Again, thanks for staying with us and for providing your comments. I was surprised that the pictures matched the suite. I was even more surprised to see just how fully loaded the place was. It had boogie boards, chairs for the beach, etc. Great place, I would return but would hope fresh batteries are supplied for the TV remotes. Beautiful condo, amazing views, great location! We had an issue upon arrival due to a scheduling error but contacted Alice, the local manager, and she dealt with it immediately. We visit Honolulu often and look forward to staying here again. Excellent accommodation in a prime location. Phenomenal views and proximity to everything.Lanai is a bit small but it works - for 2. Comfortable, spacious and not noisy. Only negative for us was the excessive loudness of the bathroom ventilation fan. Highly recommend that you replace it or at least put it on a separate switch. Will definitely stay here again. We had a minor sink problem and Alice had it repaired immediately - good service. Overall - hard to beat. We had a wonderful visit to Waikiki and enjoyed our stay at the Ilikai Marina. The kitchen was fully stocked with everything we needed. And I appreciated the beach towels and beach "toys"! The large, spacious bed was very comfortable. Thanks for a great stay! Always nice and clean the times we stayed there. Will always be our first choice. We stayed here with our 4 year old and 2 year old. Great family space - lots of room for a one bedroom. Great beach toys, etc. Also a pack and play was in the closet along with beach chairs. Front row view of the fireworks on Friday night right from the balcony.Great location - short walk to the mall and beach and lagoon. I really want to review this condo as a 5 because it is very nicely appointed and had everything we needed. We had everything we needed for the beach, the condo has everything we needed in the kitchen and the bathroom was renovated. However we slept TERRIBLY. The mattress appears to be new and we loved that it was a king bed. The problem was that the mattress was wrapped in the original packaging from the store. It was like sleeping on a plastic bag. Every time you would move the mattress would crinkle and it was hot!!!! I emailed the manager to see if we could remove it because we had not slept well at all. He claimed that the plastic was for protection of bed bugs. As a rental property owner myself I fully understand this concern however there are many products on the market for protection of this type of thing. It just seemed like they cheaped out and did not want to invest in the proper product for this type of thing and as a result we did not sleep well. I recommended that they purchase the proper product for this in future. If this problem is fixed in future I would 100% rent this condo again. Until this is fixed buyer beware of a terrible sleep! Thank you for your feedback. We have taken measures to address your concern. Two days before we were suppose to arrive (christmas day) we get an email cancelling our booking. Aparently due to water damage. So ended up having to book what i could find with such short notice. All money was refunded but paid alot more for inferior accomdation due to the short notice. Alohacondos were no help too just emailing back that they have no record of out cancelled booking. Never use them again. I stayed at Condo 786 for a week at the beginning of Dec 16, before I embarked on a weeks cruise around the Islands with my husbands family. I thought it was a great condo , and would definitely stay there again. Loved the position, so close to everything and the lagoon. Saw the fireworks from the lanai and as I am a sailor, looking over the marina at all the beautiful boats was amazing. The view was fantastic and you could walk everywhere. The Harbour Pub downstairs has great food too! There is an ABC shop up on the corner and a great Café with Wifi on the other corner. The facilities in the condo were good, lovely full kitchen, lounge & dining furniture, large bed was great, lanai was small, but still usable. The ensuite bathroom was great, but the fan is very noisy when the light is switched on. Also I couldn't get the main TV in the lounge to go to any TV channels, but maybe that was just my lack of expertise in technology. But the one in the bedroom worked just fine!I couldn't find the WIFI password, so rang Shirilan and he was very helpful etc. It is on the side of the modem. The only other thing I would have liked would have been a small radio, to listen to the local news and music. Other than that, everything was great and clean and I would love to stay in Condo 786 again. It was great and I loved my stay there!! Good facilities. A couple of hiccups quickly resolved by local contact Alice.Excellent location close to shopping centre and transport.Beautiful view from Lanai.Would definitely return. Our stay at your condo was wonderful! We enjoyed the beautiful view from the lanai and we were even lucky enough to see a rainbow the morning we wereleaving!! The location was perfect and the condo was well equipped with everything we needed for the beach and our stay in general. I would highly recommend it to any one staying on Oahu-thanks! Great time, great location. Condo was comfortable for the two of us, wouldn't want more than 2 though. Thanks and would come again. We love the place, we had everything we need during our stay! It's close to the mall, waikiki beach! Thanks for your feedback. We keep additional TP under the counter rather than putting them visible on the shelf. Sorry for miscommunication. The bed is new and we are not aware of any issues but we will re-examine the frame again. Again, thanks for your feedback. I rented this condo when I went to Hawaii to meet my son''s ship coming back from deployment. It was a great place to stay. The condo was very clean and everything worked great. The pictures on the website doesn't do it justice. Great location to access the beach. I enjoyed sitting on the balcony watching the surfers, the boats and the people. We stayed in this condo two years ago so it felt like coming home. The location is a perfect base to explore O'ahu - and also great to watch the fireworks on Friday nights. There is understandably a little more street noise on Friday and Saturday nights but generally a relaxing location with the marina below.The condo is a great size for two adults and we had our 11 year old sleep on the double sleeper sofa. Two smaller kids could work too.We were very happy there and would definitely consider booking for a third visit. I recently had a 9 day trip to Hawaii in which I stayed at condo 786. Although this was more of a business trip than a vacation, I look forward to taking a family vacation returning to Hawaii in the future and I would gladly stay in condo 786 again. It had all the amenities of a well furnished small apartment, overlooking the marina and an easy to access parking ramp right outside the condo. Very clean unit with plenty of amenities. Great location adjacent to Waikiki beach, with a great view over looking the marina. Not a single complaint. A terrific owner as well. Thanks again from this Navy family. Great location, convenient to shops, beaches and restaurants.Great view from the lanai. It was the perfect place to watch the fireworks.We were very happy and would like to coming back again! We stayed here for 10 days. This was our second time staying in this room. All the furniture has been upgraded; it was very nice. Plus the management was perfect. Everything was perfect except for the noisy bathroom fan and living room a/c fan. Both were extremely irratating and distracted from an overall rating. Great! Reasonable rate. Nice view, beautiful sunset, and close to shopping, and waikiki.Thank you! we love Hawaii islands of people, weather, culture.....this was seventh timesvisit these magical hawaiian island. we always stayed at hotel when visiting these islands but we decided this time as some change renting this condo.this condo is so great as locationally, it is just near waikiki beach as well as ala moana beach. even ala moana shopping centre is walking distance.....another amazing advantage to rent this condo is you can enjoy every day breath taking hawaiian sunset from condo room.room is clean ,once week cleaning woman very cleaning up very well. no complain !! we found only oneproblem is that mattress is old and not comfortable.if this is replaced as newone, we give 5 stars rating as review. this is great condo to rent !!! The owner of this apartment is a kind and generous man....thank goodness because we had a really sorry start to our stay at 786,there had been some miscommunication with the cleaners and the place wasn't ready when we arrived at the appointed 3pm. the impression was grotty and dirty and hot. lots of phone calls and juggling and vacating until the job was done. Then the air conditioning was broken and the wifi didn't work......and it was a holiday weekend so nothing until the 4th day into our stay. The bathroom was especially filthy, cupboard door handles were broken and there were exposed nails from cabinetry in the kitchen. the whole thing was second rate. I have two complains:1) Air conditioned did not work during my entire stay ay Condo. It was hot.2) There were insufficient toilet rolls provided. I had to buy more from ABC store. Everything was just as described. The location was fantastic: the beach, shops, restaurants and transportation were all very short walks away. The view overlooking the marina was as good as advertised. I would definitely book this condo again. Information/Directions to Condo 786 from Aloha Condos were clear and concise as was info. on gaining entry.Condo. was well furnished, if not a little old fashioned.Curtains need immediate attention.Everything we needed for a very pleasant stay was available in the Condo. Very comfortable bed and pillows.View from the large sliding doors was to die for,simply magical.Great position within walking distance to all major Waikiki attractions and Restaurants.A value for money Condo. This was our fourth stay at Shahin's condo on the Ilikai Marina and we hope to come back again. You can't beat the location at the end of Waikiki beach and the beautiful view every morning of the ocean and the boats on the marina! The condo is very comfortable with a King bed, sitting area, full kitchen and necessities that make it easy to head off to the beach. We always enjoy having a kitchen to cut down on the expense of eating out every meal. An ABC store is conveniently located right across the street where you can pick up almost anything. Great stay as always and excited to return! The entry through the given code and instruction was straightforward. The condo is spacious for two people with separate bedroom, lounge, kitchen and bathroom, with a tiny balcony less than a metre wide. The balcony is so tiny that it makes me feel uneasy to sit there and enjoy the panoramic view of the marina and sea. Hot water in the shower is good. The air conditioning is good. Though the unit is dated and the furnishing is average, it serves the purpose. Read the material in the folder for wifi/tv instructions, and info on restaurants, bus, etc. Our wifi connection was down for two days and the caretaker Alice was prompt in coming to the condo with an IT guy to fix it. One major problem was the bed with soft springs making the bed sag. Tv Chanel's are adequate, with good selection. The condo has a phone for free local calls. We used the phone to ring the bus help desk, airport transfer and Alice the caretaker.Location was superb. It is on the trolley/bus lines, and walking distance to Ala Monah for the food courts. We could also enjoy the walk to the eastern end of Waikiki, and watch the free Hula show at Kuhio beach. The ABC stores is more expensive (milk, cereals, soap, eggs, ice cream) compared to food pantry on Hobron, which is not far at all. Walmart is excellent and deserves a visit. We found it easier to locate by going to the men's section at Nordstorm in Ala Monah centre and walk out to Kapiolani blvd. Walmart is within 100 metres, with Ross Dress for Less on the other side of the road. Later, we only bought water from ABC. The country express bus goes from here to Waipahu transit centre and from there bus 433 takes you to Waikele factory outlets - all for $2.50 and in an hour travel time. It is reasonably easy to do. The locals are very helpful if you are lost at Waipahu. From the transit centre it is walkable to the outlets if you know the way. We had seen photos online before we arrived but nothing beats the gorgeous outlook from this apartment. The condo was extremely spacious for the three of us (2 adults, 1 child on the sleeper sofa - two children on the sleeper sofa is possible as it is a large one). Our flight into Honolulu arrived at 2am but getting into the apartment was so easy, thanks to Shalin's excellent instructions. The apartment is equipped with everything you need, and more, from a folder of menu's from local take-outs and restaurants, and even a selection of paperback books to read.It is also a perfect location to watch the fireworks on Friday evening at the Hilton Hawaiian Village next door.We felt very much at home during the week we stayed there, and if we return, we will definitely hope to stay here again. Really convenient, walking distance to a convenience store, parking in the building $20/ day ( normal in Waikiki) , beautiful harbor view from window. We really enjoyed our stay. Thank you very much. Location, view and amenities, this condo has it all! The view out over the marina to the southwest is awesome. This does allow for some traffic noise. The condo is dated but everything including the fans, AC and all the kitchen things work well. We did not want while staying here. Plenty of beach things, a small library a great internet connection. Easy walking distance to all of Waikiki, the ala Moana Beach Park and Shopping Center. The ease with the business end of things was an added bonus. Great stay! The condo is nice with great marina views and lovely sunsets. It is conveniently located for the Waikiki area - Close to the ocean and lagoon and only 5 mins walk from the main mall.The condo is much more convenient than staying in a hotel with all basic amenities provided, a comfy bed and great a/C.This condo is really good value for what you get in the Waikiki area. Mahalo Shahin for our stay. We had a lovely 4 weeks at this nice condo. It exceeded our expectations in every way. It was clean, very well equipped in the kitchen, and more spacious than the pictures showed. The view was absolutely incredible looking out over the harbor. Excellent location for walking to beach, shopping mall, and even to the movie theater a little farther away. The building has a safe feeling even in the evenings. Plenty of casual and fine dining choices just out the door. The owner, Shahin, was excellent to deal with - he quickly responded to emails, and kindly helped with special requests. We would love to return to this unit on our next visit! Our most sincere thanks for a lovely condo. For a condo with ocean views, A/C, view of fireworks (at the Hilton) and sunset views, this condo and its price can't be beat. Owner Shahin was wonderful to deal with. Our family enjoyed our stay, just note these items:- self parking is $20/day at the attached parkade (very convenient access to condo)- condo is somewhat dated (esp kitchen, we didn't use the microwave which looks rather ancient). Bath towels were also a bit worn.- bathroom fan is super loud, limited counter space, and shower is dark (bulb must be broken). Be careful changing the toilet paper, one end is loose and the entire thing will pop out.- closets are rather cluttered and not well organized, beach towels and extra pillows were stored in several closets- no tea towels in kitchen, no new dish sponge, etc. Thankful for full roll of paper towels. Overall, we enjoyed the condo during our 3nt stay. If you have any questions, Shahin will respond to them quickly. Mahalo Shahin! Thank you for your comments. We will replace the microwave and the towels ASAP. The light in the bathroom is already replaced. Located 5 minute walk from Waikiki and ala Moana shopping center. Everything you need for cooking, enjoying the beach. We had a very nice stay at Ilikai Marina Condo 786. It is very conveniently located to Transpac Row in the marina and the rest of Waikiki. My only suggestion for improvement would be to post some of the relevant rules near the location that they apply. An example is "no stuff stored or hanging on the lanai" We found out by getting a polite "warning" notice and then corrected the issue. All-in-all, the condo was just what we needed in Waikiki. We stayed in condo 786 for a week. The accommodations were as advertised. We appreciated the fully appointed kitchen, the beach chairs, boards, etc. that were provided. The mattress on the king sized bed may need to be replaced soon as it sags a bit in the middle. The condo is over a restaurant/bar and can be fairly noisy at night if one is a light sleeper. The condo is conveniently located near the ala Moana park and shopping center with easy access to Waikiki and bus service. I do not hesitate to recommend this as a good housing option for anyone on a budget as it is very reasonably priced. We love the location and the size of the condo. With full kitchen, big bed, nice size living room. it was perfect for the 2 of us. 1. It was very dirty under the furniture like bed and sofa. that needs to be cleaned. 2. The bed or the bed sheet smells (I'm not sure). We have to spray it at night and spread it out during the day. it's clean but there is a smell to it, I can't describe. The rest is all good. I would go back again. Overall it was a good experience. The location is by far the best part of the condo. The amenities were good but not all that convenient. The condo was clean but it had a musty smell to it that lingered.It had items that you could use like body boards, snorkel gear, chairs and other handy things. That was nice to have. Overall for the price and location it was good. I would do it again. Perfect! Home away From Home! Great condo! Gorgeous views. Second condo we've rented at the llikai Marina. Perfect location next to Modern Honolulu and the Hilton Hawaiian Village. Be sure to check out their Fireworks on the beach every Friday Night! Pre-pay parking at the garage. No pool but great beaches. Cute deck with outstanding views. We have found the llikai Marina to be a fantastic value and a perfect home away from home! We stayed here for almost a week and really loved it. It was nice being in a touristy area with all the shops and stores, but having our own private oasis among it all. The place was wonderful to stay at and had everything we needed to feel like at home. Though the air Conditioner was not strong enough for my liking and it took a few days to get used to the warmer sleeping situation. But my partner had no problem with the warmth. But once I got used to it, it was great. The parking lot is connected to the apartment buidling, which was great for moving stuff in and out of the building. It is about a 15 minute walk to were all the action is, so not far, but perfect distance to not be right in it. The view! the view, this place has the most amazing view, whether it is watching the sunrise to sunsetting, it is a dream to look out at. Make sure you book a Friday stay as you can watch the fireworks from the balcony. Overall, we enjoyed it a lot and the host was very helpful with all inquiries. Condo unit has view of marina and away from the main part of Waikiki but close to Hilton Hawailian Village. Parking is available within the building for $20.00/day prepaid with in and out privilege. Parking on the right floor will make it easy for unloading as condo unit is just steps away without taking an elevator.Unit is clean throughout with kitchen well stocked with everything needed for cooking a meal including spices.2 set of bath and beach towels available for use as well as beach equipment (chairs, boogie board, snorkel stuff). The only item that would have been nice to have is a cooler. Overall, good place for us. Walk to the beach and the mall. Nice location and good supplies, including beach towels and chairs, boogie board, etc. The sofa converts to a pull-out bed. Appliances are outdated but functioning O.K. Bathroom looked recently renovated. For families, this is a very good place to stay. 4 people can sleep comfortably. The owners manual says the condo guest can access almost all Ilikai hotel's amenities, but the hotel staff says a different story. We got kicked out of the hotel pool. Also, the condo is on the dock, so it is very noisy in early morning and at night as well due to the traffic, garbage trucks and the drunks at the pub located on the first floor of the condo. That helped us to start days early. Parking is $20 per day, so expect to pay additional fees.Otherwise competitive pricing. My family of 3 stayed in Condo 786 for a few days as we were passing through and catching some sights around Oahu. The owner/manager was very helpful getting us the information needed to check in/out. Condo was well stocked with beach necessities. Great location, 5 minute walk to Waikiki Beach without having to cross busy streets. Minutes away from all the Waikiki excitement...food, shopping, fun, just take the free Waikiki shuttle. We paid $20 a day for parking in the Ilikai's garage, which was well worth having our vehicle just steps away. Ilikai Marina 786 is fine! My family enjoyed staying in this unit. It has what we needed. Having the full kitchen made life much easier as we could prepare the meals we wanted to prepare. This cut the potential food expenditures in half. It is well-equipped with a few additional beach items. Being well located between ala Moana Center and Waikiki was a bonus. I highly recommend this unit as a superb alternative to a crowded hotel room, or two hotel rooms. The owner, Mr. Shiralian, is considerate and friendly. He allowed us a late check out as the unit was unscheduled and our flight had a very late departure. Give this unit a try. I am sure you will be pleased. My boyfriend and I stayed at Illikai Marina room 786 for 14 days.I highly recommend this place of stay for several reasons:1. As a woman, I like my breakfast with all the amenities like a skillet,pots, utensils, etc. This room had it all!2. The room was spacious and comfortable. I especially enjoyedthe sunrise and sunset in the room... Just breaktakingly beautiful.3. I don't think this room left out anything... We needed a beach towel and they had it! Awesome!I would definitely recommend this place to my friends and family. Our 6 nights at Ilikai Marina Condo 786 was all and more. The kitchen was well equipped with large oven, microwave and dish washer. A well appointed bathroom and lots of storage through out. Comfortable lounge room with the best view over the marina and a great viewing spot for the Friday fireworks.A very big thank you to alice. This condo is prettier than the pictures, and very well equipped.It's at the end of the Waikiki area, but still convenient to shops, restaurants, the beach, & the bus line. (About a 10 minute walk to ala Moana shopping center- buy your groceries there, as well as anything else you can possibly imagine). The bed was very comfortable, and when we had trouble getting the t.v. working,the local contact for the condo responded immediately & helped out. A great value for the money, although the cleaning fee (for a 3 day stay) seemed a bit high - but it is Hawaii, where nothing is cheap, and the daily condo rental itself was very reasonable. The condo overlooks the yacht harbor. You can also see the ocean and Waikiki beach from the bedroom window. The unit is good for two to three people. The location is ideal for shopping, access to beach, dining out and other fun activities. Convenient location for tour bus pick-up (at Ilikai Hotel) across the street. Paid parking available attached to Ilika Marina. The condo is close to everything you would need; we did not need to rent a car except for one day. We did not use the kitchen much but it would help to have newer dishes. Bathroom is on the smaller side with only a shower stall. There is no tub in the bathroom. There was enough linens and pillows. The sofa bed was quite comfortable. Wireless internet is available and free. We found everything we needed there wish balcony was bigger but other than that it was great. Parking is more now i paid 10.00 dollars a day but it is what it is on these islands. Kitchen was well equipped and everything worked that i used. I've visited Waikiki 4 times over the years and stayed in various levels of accommodation namely the Waikiki Shore appartments, Sheraton Waikiki and the Outrigger on the beach. 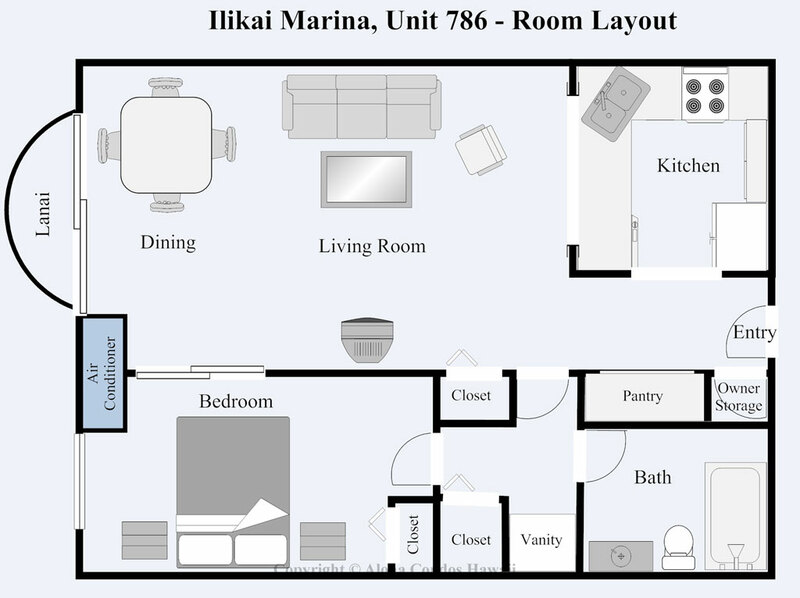 In my opinion the Ilikai Marina represents the best combination due to being an apartment with full kitchen, having a perfect unobstructed ocean+marina view, conveniently located between the Hilton lagoon and the ala Moana shopping center. Then there is of course the significant price advantage over a hotel stay or even other comparable apartments. The apartment itself is fully equipped with everything you could require. My only slight misgiving would be the size of the lanai which although serves its purpose is a little small (room for two chairs and a small table only). The other significant plus is the owner Shahin who is very easy to deal with and provides first class support for any questions or issues you may have. I would certainly stay in condo 786 again. My first visit to Hawaii was most definitely enhanced by our stay at Condo 786. Waking up to views across the marina to the ocean was a great way to start each day.Watching the fabulous sunsets from our lanai was a great way to finish the day. A small disadvantage of this western outlook was the sun streaming in during the afternoon necessitating drawing of the curtains. See-through climate control blinds would have been appreciated. Nevertheless, close proximity to beaches and shops of Waikiki, and pickup points (for local and tour buses) made daily activities easy and pleasureable.Our compliments to alice, the local manager,who handled a small maintenance issue with speed and coutesy. Email negotiations and contacts with the owner made the booking arrangements easy and personal. I really enjoyed my 12 day stay. It is a great location and unlike other rentals I have had in Honolulu one does not suffer with noise problems here. Having the Parking Station next door connected to the Building was very convenient when I picked up a rental car. Condo was very well furnished. I thoroughly enjoyed staying at the vacation rental. The room was spacious, clean, and had an excellent view. I also appreciated that there was ample parking in the building's lot. I worked late every day and it was nice to know I always had a convenient spot to park my car. I was very very pleased with the unit. It was clean, everything worked, and the location was just perfect. It was nice that the Kamehameha Day parade went by the Marina. I recommend this unit if you don't want to be in to far in Waikiki. I would stay again in this unit. Terrific location and view at an unbeatable value! My husband and I decided to book this condo during our first vacation to Hawaii for our anniversary. If you want to stay in Waikiki but don't necessarily want to be in the heart of all the action, then this location is perfect for you. Very convenient to ala Moana Shopping Center, Ala Moana Beach Park, Hilton Lagoon area, and more. The condo itself was great, with only very minor cleanliness issues (i.e. I had an item roll under the bed, and noticed it did not appear to be vacuumed under there - quite dusty). Other than that though, everything you could need comes with the condo: towels, sheets, beach chairs, a boogie board, wide assortment of kitchen items, roll of paper towels, 3 rolls of toilet paper, a bar of soap, and dish soap. Bottom line: I would definitely stay here again in a heartbeat when visiting Hawaii in the future. This condo provided everything we needed. The kitchen was well equipped. Bed was comfortable, as was the pullout couch. Be prepared to pay for the parking. Close to beach, park and shopping for walkers and right on the trolley transit route. Beautiful view of the ocean just over the tops of sailboat masts - not through them. The restaurant/bar below was not too loud to bother us and we actually enjoyed the sounds of jazz sax on a few nights while sipping a beverage on the lanai. Our only observation that could be changed is that the bathroom fan sounds a bit like a plane taking off- it is quite loud. The internet met all the needs of our 15 year old son and it was great to be able to make local calls from the unit. We had other family members come over for supper and the table expanded nicely - there are only six chairs so we had to improvise for the two others we needed. We were ther over New Years and it was great to be able to stay in the comfort of the condo and our own beverages to watch the fireworks from the lanai. The lanai is small only two people but there is plenty to see, susnsets. whales, surfers, planes, sailboats, birds, and of course there are always a few people to watch on the street below. We were glad that we chose the ocean view as the other view looking towards the mountains overlooked a parkade. the condo provided beach towels and we left a boogie board there,couldn't quite figure out the red beach chair. All in all yes we would stay there again. We loved staying at Ilikai Marina Condo 786. It is located within 5min from Rainbow Hilton Tower and Hawaiian Village. Condo was neat and cozy. We were surprised to find more kitchenware that we could possible hope for and all needed beach supplies (towels, chairs, etc). Unit also had TV and unlimited WiFi access. Ac worked quite well. Laundry room was available in the building, but not on the same floor as condo. Would highly recommend, if you would like to spend quality time for less. We really appreciated the location. We enjoyed a harbour/sunset view without paying the price of a hotel on Waikiki beach. It was convenient/close to the great bus system on Oahu. It was also within easy walking distance to the ala Moana shopping mall and the Waikiki strip. The bed was king size and comfortable - always important! The unit was spacious and comfortable. The lanai was very tiny and not really good for spending any time on, but the view was great. The kitchen was very functional but the stove wasn't working when we were there so a hot plate was provided. We had planned on cooking but couldn't really so eating out was necessary and that is expensive. The hot plate was not great as it took a very long time to boil water for a cup of tea! I also called the cleaning service as one of the bedroom side lamps was broken. She said no problem, but never came to fix or replace it so we had to move a living room lamp to the bedroom for the week. The cleaning service fee is way too high. Unfortunately the glass surface stove broke when another guest dropped a heavy object on it. I placed a hot plate during the wait period. Great way to go for those with no need for room service!! 3rd year using alohacondos.com. Good value due to the accessibility of Waikiki, ocean view, fairly large one bedroom with most amenities, $120 service charge for cleaning slightly excessive but overall good value. I stayed previously at this condo about a year ago. At the time I forgot to leave a review. This time I didn't forget. As one year ago this condo experience was great. Great location in Waikiki, very close to shopping and entertainment. Beach is just steps away and an incredible 180 degree view from the patio. The condo is clean, has a full kitchen, wireless internet and cable tv. The bed is huge and extra comfortable. The owner of thee unit is a real gentlemen, I assure you that. He will always try to make all your requests possible. I will be back in Unit 786 very soon. Quiet and Lovely with a nice view of the ocean. I enjoyed my stay in this very clean, roomy, 1 bedroom condo. It had a large, beautiful bathroom and a fully equiped kitchen. There were beach towels, a beach umbrella, coolers, etc in the closets. I really felt at home. Great view of the yacht harbor and the always blue Pacific Ocean. We've stayed in this condo in 2009 and 2010 and would return again. Owner is good to deal with. My parents and I stayed here in Jan, and we truly enjoyed our stay - like a home away from home for us! We also loved the view of the marina and the pacific ocean. The location is convenient too. One minor thing - I wish there were door/window screens so that we could open the door and window without having to worry about bugs/birds coming in. A very comfortable and thoughtfully set up apartment in a handy location with a good view of the marina.We will definitely come back. This condo was very nice, plus it was in a great location. Everything you could need was there, and in excellent condition. It was close to shopping, ABC stores, Wikiki, bus routes, etc. We'd highly recommend anyone staying there. It was an absolute pleasure to return to my "hometown" and spend it in such a wonderful condo at the Ilikai Marina. Waking up every morning to the beautiful view of the Marina and the best sunrise. Sunsets was also spectacular.It was very comfortable, well equipped and convenient. Hope it will be available the next time I get to return "home" again. Our family thoroughly enjoyed our stay in Waikiki, and having this condo had a great deal to do with that. It was very clean. The kitchen was well supplied. All necessary linens were supplied. There was even a fold-out crib for our youngest. The view over the harbour was amazing...some of the nicest sunsets I have ever seen. I would definitely recommend this condo to couples or small families! We thoroughly enjoyed our stay....so much so that we're thinking of returning in 2010.